Stadium of the Year 2013: Last call for nominations! After your suggestions we've done a lot of research to check if submitted stadiums are eligible to compete for Stadium of the Year title. Many times the answer was negative, but there's still time to suggest more nominations before the vote begins! On January 7 we first asked you to help us complete the list of Stadium of the Year 2013 nominees. Based on the stadia we already covered at StadiumDB.com we compiled a list of 16 nominations, but opened it for additions of your choice. The following stadiums submitted were found not eligible to compete for last year's best stadium name. There were only two reasons: they either weren't opened in 2013 (even if structurally ready) and will be able to compete next year, or the extent of redevelopment works was insufficient. If the above list doesn't include stadiums you think should be nominated, check out our initial list as well. If there's any stadium you'd like to add, please fill in survey and let us know. This is the last call for entries – the nomination list closes at midnight (CET) on Tuesday, Jan 21. 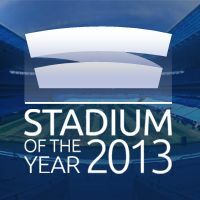 As we complete the list of nominations, the month-long open online vote for Stadium of the Year 2013 will begin on January 22. So be sure to visit us soon and share your opinion about the best stadium opened last year!